Get real interactive expression with NVIDIA Quadro-the world's most powerful workstation graphics. Tackle your most demanding visualization workloads with ease using the advanced NVIDIA Maxwell™ GPU architecture and the flexibility of a single-slot form factor. 8 GB of ultra-fast memory enables the creation and rendering of large, complex models and the computation of massive datasets. A new display engine drives up to four 4K resolutions displays natively (4096 x 2160 at 60 Hz with 30-bit color). Pair up two or more outputs to drive displays greater than 4K, and take advantage of NVIDIA Quadro Sync support to frame-lock multiple displays together (see PNY PN VCQM4000SYNC-PB), or use external I/O boards and NVIDIA's GPUDirect™ for Video to integrate the Quadro M4000 into broadcast, video or film production workflows. 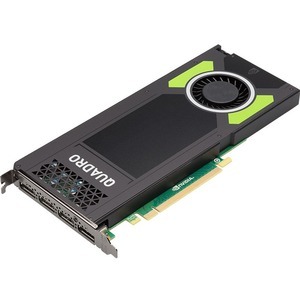 Designed and built specifically for professional workstations, NVIDIA Quadro GPUs power more than 200 professional applications across a broad range of industries including manufacturing, media and entertainment, sciences, and energy. Professionals trust them to realize their most ambitious visions- whether its product design, visualization and simulation, or spectacular visual storytelling-and get results to market faster.